A water re-use company has notched up an impressive 40,382km by bicycle in 2017, for a national charity. 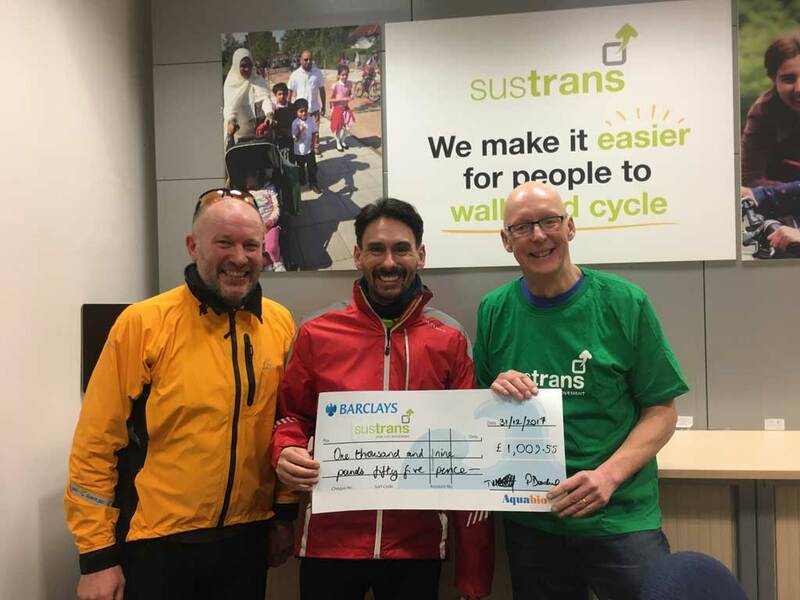 Sixteen employees from Aquabio Ltd – based in Worcester – have collectively cycled more than the equivalent of the circumference of the planet, equating to a charitable donation of £1009.55 for cycling charity Sustrans. The scheme is part of Aquabio’s wider corporate social responsibility campaign. As part of this, the company set up a scheme called Sustainability and Health in Future Transport – or SHIFT – in 2017; the initiative involves Aquabio employees logging their kilometres with Strava while cycling to work and for leisure, and for every kilometre cycled, Aquabio donates 2.5 pence to Sustrans, a charity that makes it easier for people to walk and cycle. More than 1000 Aquabio commutes took place by bicycle over the year, mostly from Worcester to the head office in Hallow, and from Boston in Lincolnshire to one of its operational sites. There were also longer commutes to the office from places as far afield as Wednesbury, Cannock, West Bromwich and Rowley Regis. A number of employees also combined train travel with cycling. During 2017, 4 new bikes were purchased and the scheme was applauded by a Health, Safety and Environmental Audit from Achilles, an independent organisation that identifies and manages risk. Sustrans works with a number of corporate sponsors including The People’s Health Trust, which empowers communities to reclaim their streets and public spaces; Wiggle Legal, designed to help cyclists back on their bikes after an accident; cycling holiday company Saddle Skedaddle; Cravendale; Halfords; Triodos Bank and green energy company Tonik. The company’s aim is to support a better future for cycling. Strava Insights for the UK show that in 2016 an average of 223,376 commutes were uploaded to Strava every week, with cyclists logging an average distance of 13.5km and an average of 35 minutes in the saddle. In 2015, the first ever Strava Challenge to ride to work saw a total of 79,879 cycling commute activities logged on Strava across 180 countries; as a result, 514.51 tonnes of carbon emissions were offset on the day. Based on 20,000 km commuted at an average of 118g/km of CO2 – 201 European average – Aquabio employees saved 2,300 kg of CO2 from being released into the atmosphere. Aquabio – which operates from its headquarters in Hallow, Worcestershire – was established in 1997 and is a European Leader in industrial water, wastewater and air treatment, and water recycling and reuse. The company has pioneered the implementation of water recycling within a wide range of industries including food and drink, bio fuels, pulp and paper, landfill and leachate and pharmaceuticals. To find out more, please visit www.aquabio.co.uk/company/shift. For further information please contact Dan Brothwell, Development and Operations Manager, Aquabio Ltd on 01905 641 966.